When I was a kid, one of my all-time favorite treats was Knox blocks. 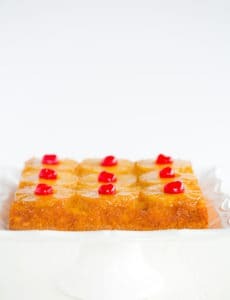 They typically appeared at summer parties, and there was something so fun about picking up a dense square of Jello and eating it with your fingers instead of needing a bowl and a spoon. Through the years, the name “Knox blocks” phased out and those treats became better known as Jello Jigglers, and then finger Jello. 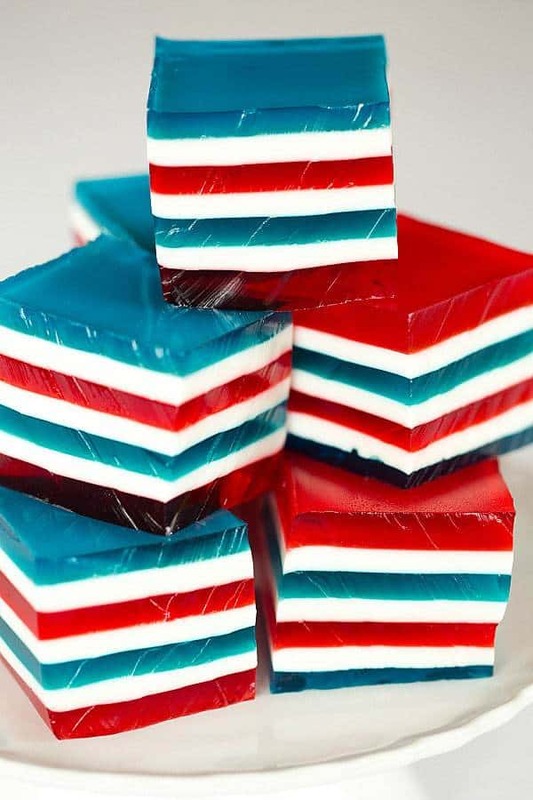 A few years back, I made really fun red, white and blue stained glass Jello for the 4th of July holiday. 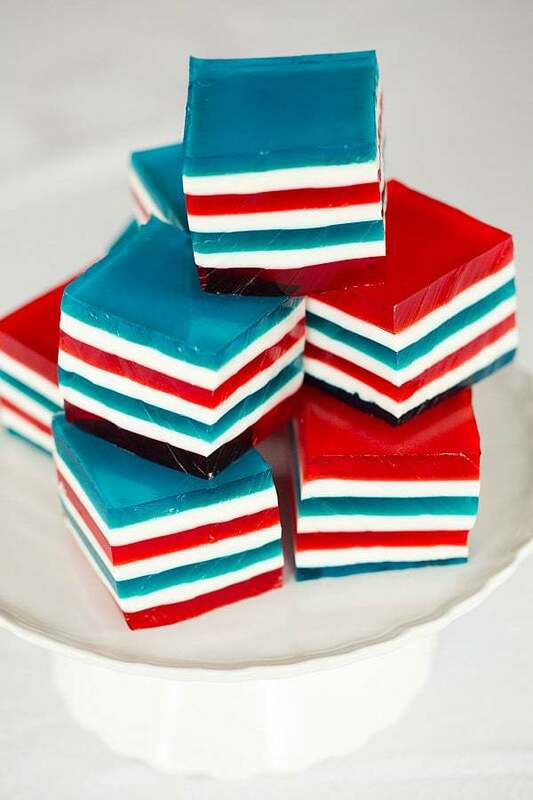 This year, I used a similar technique for a festive layered Jello dessert. My grandma has an old family recipe for ribbon Jello, which is layers of colored Jello alternating with white layers. It’s definitely a showstopper type of dessert, but is incredibly time consuming to make. 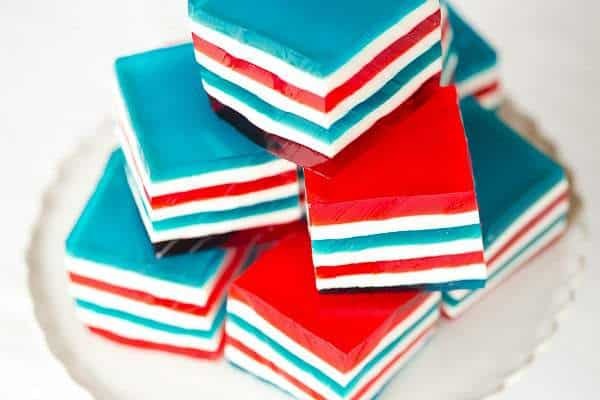 I loved this new method I used for the red, white and blue Jello… using a half envelope of unflavored gelatin for each color enables the layers to set up firmly and quickly, so assembly goes much faster. I also found the white layer much easier to use with this method! This is an awesome layered finger Jello recipe for any type of layered Jello you’d like to make – whether it’s a rainbow, colors for a sports team or graduation, a holiday… change up the colors for something unique each time! 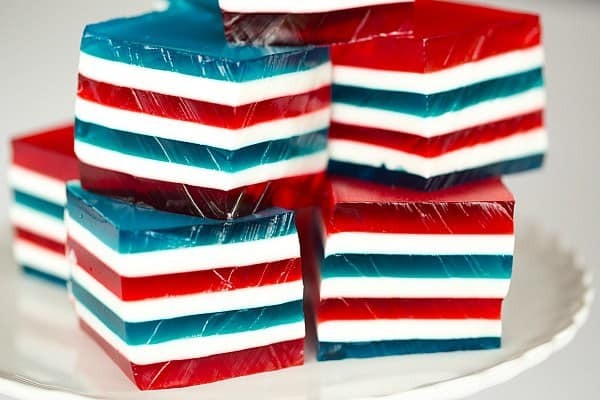 Festive red, white and blue layered finger Jello, a.k.a. Jello jigglers, a.k.a. Knox blocks. 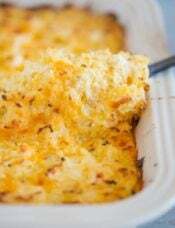 Spray an 8-inch or 9-inch square baking pan with nonstick cooking spray. In a small bowl, stir together 1 box of the strawberry Jello, ½ an envelope of the Knox gelatin and 1 cup of the boiling water, ensuring everything has dissolved. 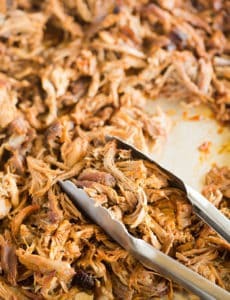 Pour into the prepared pan and place in the refrigerator to set, about 15 minutes. Meanwhile, in a medium bowl, stir together the sweetened condensed milk and 1 cup boiling water. In a separate small bowl, sprinkle 2 envelopes of the unflavored gelatin over ½ cup cold water. Allow to sit for 5 minutes. Add ½ cup boiling water to the unflavored gelatin mixture and stir to dissolve. 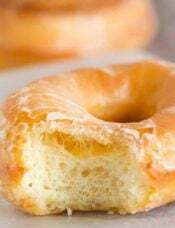 Pour into the sweetened condensed milk mixture and stir to combine. Once the red layer is set, pour 1 cup of the milk mixture over the red layer. 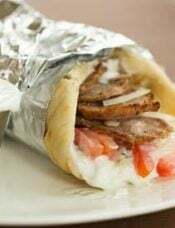 Place in the refrigerator for at least 15 minutes. Repeat the layers, alternating the red and blue between the white layers, with blue being your last layer. Ensure that the colored Jello mixtures cool to room temperature before pouring over the previous set layer. Once all of the layers have been poured, refrigerate for at least 4 hours. When ready to serve, run a thin knife around the edges of the pan and turn the Jello out onto a cutting board. 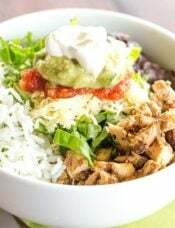 Cut into squares and serve, refrigerating any leftovers. Such a fun, colorful treat! About how high are the seven layers together, please? Do you think three layers would be enough if using a cookie cutter? Thanks for sharing your recipe. Hi Rosie, They’re pretty tall, I’d estimate maybe 2 inches. I think three layers would be enough if you want to use a cookie cutter! I’m guessing you only use half the can of milk per layer? 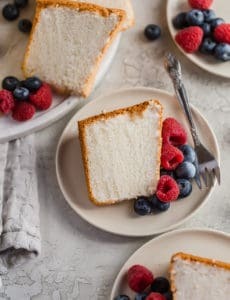 Hi Elizabeth, Please see the recipe directions – you need to use the entire can to prepare the white layer, but you only add 1 cup of the mixture at a time. 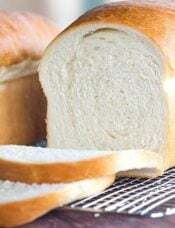 How do you get the white layer so white? Mine always comes out sort of yellow from the sweetened condensed milk. Hi Brenda, I’m not sure, I didn’t do anything different? Might just be the lighting! It may be the brand of condensed milk. I am using Eagle brand and its very white. My husband just opened an Eagle brand can and its definitely darker in color. Seems to be related to age of the can. Google “why is my sweetened condensed milk brown”. Consensus seems to be it has to do with time elapsed between canning of the milk and use. I made these today. What she fails to tell you is that you have to let the sweet condensed milk chill to room temperature before pouring over the red. My white mixture bled and became pink…. Seriously? Red pink and blue?? Now I have to start all over and go get another can! Ugh… Angry mother who was supposed to bring red white and blue jello jigglers!! Pinterest fail! I guess you didn’t read the part where it says to make sure the jello mixes cool to room temp before adding the next layer. More like Mommy following directions fail. This looks so pretty! I really want to make it, but I don’t like jello. Those are awfully darn cute! 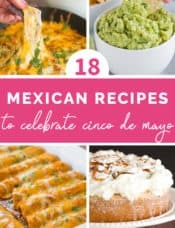 I’m sure they will be a hit at any 4th of July gathering!